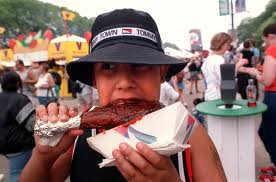 Taste of Chicago 2011: Is Taste Getting Stale? And What to Expect at This Year's Taste. Chicago, Thursday, June 23, 2011. If the past is any indication of the future, it looks like this year's tasters will be consuming literally tons of Eli's cheesecake, Manny's turkey legs, Rainbow's ice cream cones and Robinson's boneless ribs--all perennial Taste favorites. Taste-goers may want to step out of their comfort zones with something new this year. There are 12 new vendors at the 2011 Taste including: Chinatown's Lao Sze Chuan, offering a taste of dry chili chicken, salt and pepper pork ribs, crispy shrimp in lemon sauce and more; another interesting choice is the Parrot Cage, a culinary school located inside the South Shore Cultural Center that will be cooking up Taste specials including turkey meatloaf, gumbo, seafood salad and red velvet cupcakes. Others in alphabetical order are Alhambra Palace, serving Middle Eastern selections; Atomic Cake; The Banana Leaf, a South Side of Chicago spot with lamb chops, jerk chicken and blackened tilapia; Beggars Pizza; Chicago Sweet Connection Bakery; The Fudge Pot; the Loving Hut for vegetarians; Ryba's Fudge; Smoke Daddy with pulled pork; Starfuit Cafe where you can get a taste of Lakeview's frozen kefir and Texas de Brazil with heavy-duty meat offerings. Celtic Music Day and July 1, Country Music Day. The "biggest names"
Tastes change but Taste remains the same. Earlier this year, there was a move to privatize Taste that never got off the ground due an impasse on charging an admission fee. Unlike the privatization fiasco of the parking meters, privatizing Taste may be an idea who's time has come--or should have come. It would have meant more big-name entertainment instead of less and since the admission fee included food tickets it may have kept those who were wandering around Taste for purposes other than eating on the outside. The rejected bid was from Celebrate Chicago, LLC, a specially formed partnership between Chicago's JAM Productions, the Illinois Restaurant Association and the heavy-hitting national concert promoters AEG Worldwide. Police Superintendent Garry McCarthy announced Tuesday that there will be additional police surveillance at this years Taste both inside and outside of Grant Park. Safety measures put in place include: more plainclothes police officers, "Safety Corridors" between the park and Metra and CTA trains stations; a 30-minute earlier closing time (8:30p.m.) fewer access points; video surveillance; and mandatory bag checks. McCarthy declined to be specific as to where the officers would be stationed. and daily concerts. Admission to the Taste remains free. Food tickets are sold in strips of 12 for $8 or can be purchased in advance for $6 (through today) with your Fresh Values Card at Dominick's. The fest takes place at Chicago's Grant Park--just follow the crowds. Hours are 11a.m. to 8:30p.m. June 24 through July 2nd and 11a.m. to 6p.m. on July 3. Information line 312 742 4387.